Enter your e-mail address below to receive daily obituary updates. Ernest Leon Jackson, Jr., 86 of Auburn, Alabama passed away peacefully Monday, April 8, 2019 at East Alabama Medical Center in Opelika, Alabama. He was born October 8, 1932 in Notasulga, Alabama to Ernest Leon and Easel Webster Jackson. He was raised in Notasulga and spent his primary and secondary education years in the Notasulga school system. 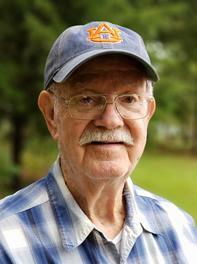 In his young life, Leon made his way “down the railroad tracks” to Auburn where he lived, worked and raised his family. He was married for 66 years to Martha Gullatte Jackson of Opelika, Alabama, the love of his life. Leon was a member of the Army National Guard and was honorably discharged on June 8, 1951. He worked for the United States Postal Service for 37 years, where many of those years he was a rural route carrier. While with the Postal Service he built relationships with many who became and remain beloved friends to this day. He was a volunteer fireman in Auburn for many years and loved serving the community. He was a loving husband, daddy, granddaddy, great-granddaddy, father-in-law, brother, uncle, cousin and friend to all he met. Many family and friends describe Leon as a funny, loving, gentle, giving, strong, friendly, selfless, kind hearted, always smiling, had a story to tell and never met a stranger. He loved his family dearly and enjoyed the time he spent with them. He loved fishing, eating out (especially at Chappy’s), traveling, socializing, Auburn sports, bingo and many more activities. He was always doing and caring for the needs of others. Leon was a long time member of Grace United Methodist Church in Auburn, Alabama. He was preceded in death by his parents, Ernest Leon and Easel Webster Jackson, his wife Martha Gullatte Jackson, brothers John Jackson, Paul Jackson, and Sammy Jackson, and sisters Sarah Jackson, Elizabeth Bedford, and Ophelia Ruff. He is survived by his daughter Sheila Arington (Stanley) and son Nickey Jackson (Kim) of Auburn, AL; one granddaughter Amy Tays (Nathan); two great-granddaughters Macy and Ava Tays of Killen, Alabama and brother Joe Jackson (Lana) of Opelika, Alabama. He is also survived by a host of nieces, nephews, cousins and many friends. Funeral Services will be held at Grace United Methodist Church in Auburn, Alabama Friday, April 12, 2019 at 11:00 a.m. with Reverend David Camphouse officiating. Interment will follow at Auburn Memorial Park in Auburn, Alabama. The family would like to express their love, appreciation and heartfelt thanks to Dr. Kevin Henderson and the nurses at East Alabama Medical Center, and most sincerely to the staff and the friends at Oak Park Nursing Home and Independent Living. Frederick-Dean Funeral Home is directing.